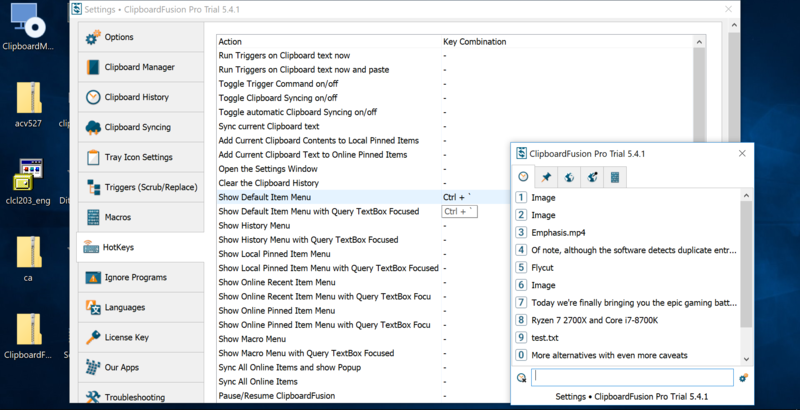 Clipboard managers make it much easier to re-enter text or anything else that you've recently copied and pasted, adding an array of new capabilities to the default Windows clipboard. Although they differ in features, the typical clipboard manager automatically saves text, images and other items as they are copied to your clipboard, displaying them in a list-style GUI that makes it simple to re-copy or paste something later. Once you're used to relying on a clipboard manager, it works out similarly as how you become more efficient with multiple monitors or virtual desktops. In this case, knowing you can copy several items before moving on to where you want to paste, performing several copy processes at once lets you save time and clicks, without having to go back and forth between windows or applications. We've been fans of Flycut (free) and Paste (paid) on macOS and like how seamless their interface is, especially its hotkeyable overlays which show a clean list of your clipboard history and an editable text field if you want to make some changes. We went out looking for a similar tool that runs on Windows with a similarly polished interface (that aspect in particular was challenging to find on Windows apps unfortunately) and useful configuration options that don't go overboard -- essentially something that "just works" without getting in the way. Our number one pick for having the most straightforward interface that is responsive and provides just enough functionality. ClipClip is also one of the most modern looking options we could find. Like most other managers it lets you assign a hotkey (defaults to Ctrl + Shift + V) which then displays a small overlay with your last copied items. You can browse this list with the arrow keys and configure how many items and how much information you want to see (file size, type, etc.) The list is also searchable (going back hundreds of clips if you configure it to). ClipClip also lets you ignore certain type of items (images or files) based on size, for example to ignore images that are over 5MB. There are configurable hotkeys for pasting with and without formatting and the overlay also lets you edit text on the fly. We wish we could configure arrow keys as the Paste menu hotkey, so browsing between clips would be more seamless, but this seems to be a limitation that affects all other apps. Thanks to its clutter-free UI and straightforward operation, we give ClipClip the top recommendation for most users. Using Ditto is meant to be a straightforward affair though the wealth of options available and old school UI may turn off many. Ditto works by right clicking the system tray icon which opens a context menu with options, while left clicking icon launches your clipboard history, which can also be opened with a keyboard shortcut of your choosing (Ctrl + ` by default). You can interact with the clipboard history in a variety of ways: double clicking an item on the list will have it automatically copied and/or pasted depending on whether you have a text field selected in the background. You can perform the same action by tapping a number on your keyboard that corresponds to an item on the list, while right clicking something in your clipboard history provides a greater range of options such as the ability to open the item in a text editor or paste it with special character formatting (all caps or all lower case for instance). Of note, although the software detects duplicate entries, if two text entries are copied with different attributes such as two different types of fonts then they will appear as separate entries. Although it doesn't automatically exclude passwords, if you use dedicated password management software such as Keepass then you can have Ditto exclude anything copied to the clipboard from that application and this is likewise provided by many of the other tools mentioned in this article. Overall, it doesn't feel like any major feature is missing from Ditto except perhaps a more intuitive interface and more accessible configuration panel. Thumbnail or icon previews for files instead of only displaying the directory text could be another potential addition though for those who prefer simplistic interfaces, thumbnails wouldn't look as clean. Initially installs with a trial of the Pro version which is downgraded to the free copy after 30 days but retains most of the core features assuming you don't care about the company's online offerings such as clipboard syncing. This one is worth trying if you like how polished Ditto is but wish it had a more fully featured interface and options such as macros. Heading to Settings > Hotkeys > Show History Menu and applying a shortcut such as Ctrl + ` will toggle your clipboard history in a compact list just like Ditto. Incidentally, so will "Show History Menu," although when we tested this option it seemed to auto-close the history after letting the hotkey go. This can be annoying at first, but if you keep holding one key the list remains open for you to hover over an item with your mouse and that item is automatically pasted as the list closes when you let the key go. Not quite as modern looking as Ditto but similarly straightforward functionality and may even be preferred by power users for its old school simplicity and the amount of information displayed. 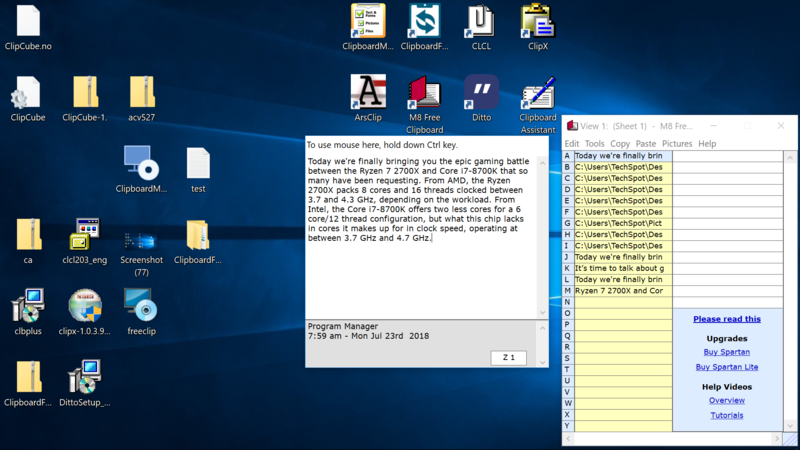 Left clicking CLCL's system tray icon opens a compact list containing your clipboard history while right clicking opens the history in an explorer style window with full details about each entry and you can edit an item with one click (click one in the left column). This tool doesn't have quite the polish or feature set as the other two but you can set a custom hotkey for launching both menus. 1Clipboard arguably looks even better than ClipClip, but it lacks many basic customization options that the former provides without getting into complex territory like Ditto. Like many other clipboard managers, 1Clipboard's paste menu shows up as a sidebar and not as an overlay at the cursor location, and its interface may be the best of all apps we tested, showing image thumbnails and other items in a very clean manner. Ultimately what turned us away from 1Clipboard is that it's not as keyboard shortcut friendly as we expect. Summoning the paste menu results in the user having to enter a number or selecting what clip to copy. 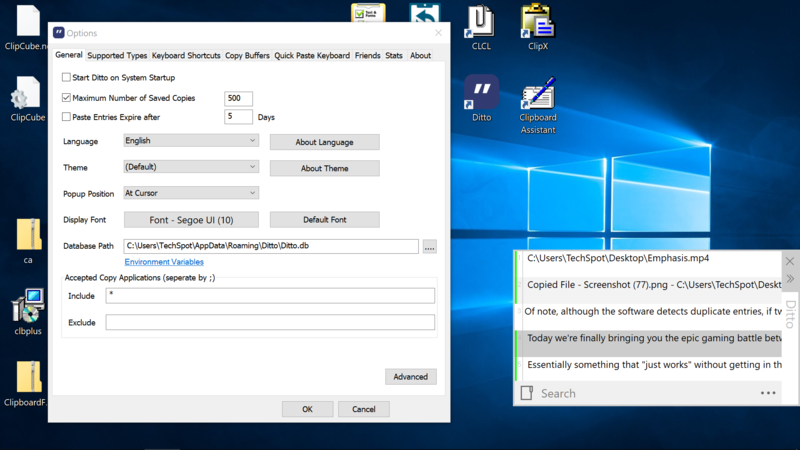 Using the arrow keys to make your selection is erratic, which is not helped by the fact that 1Clipboard will not automatically paste the item in your working window, which we found disruptive for our workflow. Similar old school interface as CLCL but strips it down to the essentials. Doesn't have a ton of configuration options and it won't auto-exclude duplicate entries to the running list of saved clips but it is surprisingly seamless to use once you head to Configure > Hotkeys and set a keyboard shortcut for "Paste Menu (Primary)" as well as "Manage" (we used Ctrl + ` and Ctrl + Alt + `). M8 Free Clipboard - Dated, semi-clunky interface (particularly the options menu) and doesn't have features such as detecting duplicate items or many options for hotkeys. However, the software is seamless with the way it shows the full clipboard entry in a pop-up window as you hover, and you can tap a single key to begin editing the item. ArsClip - Similar drawbacks here: the interface isn't as clean as the tools mentioned above and in fact we find the clipboard history difficult to read. It could use better spacing and/or less clutter, not to mention that it doesn't auto-delete duplicates etc. Nevertheless, the software does what it claims if you're interested in this tool over the others for some reason. ClipboardMaster - Has features such as an integrated screenshot tool, password manager and a list of prewritten letter closings (Warm regards etc.) but falls short on some basic interface functionality in our opinion. For example, both the left and right mouse button perform the same action when clicking the system tray icon -- they both open the same options menu instead of one of them being used to open your clipboard history. 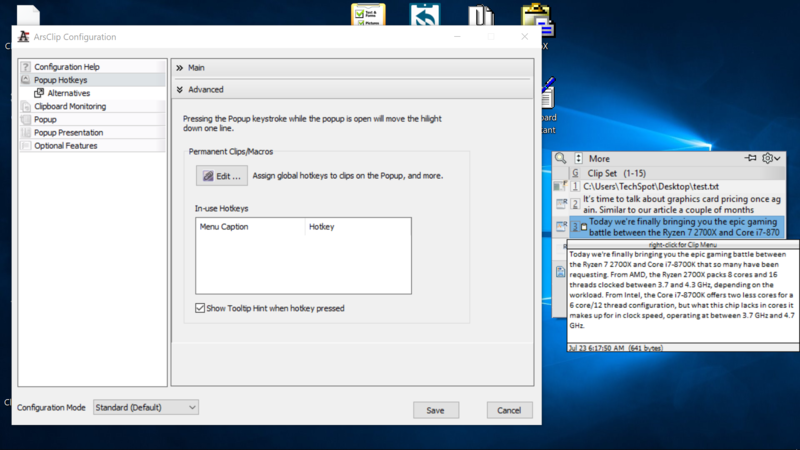 However, you can set your clipboard history to open with a hotkey as we described in the intro and you can edit these entries within a click or two from there, so overall this software fits our needs, although it's bulkier than necessary and not as seamless as it could be. Clipboard Assistant - Our evaluation of this software concluded upon seeing its overwhelming/ancient interface and errors on launching -- the opposite of a tool that "just works". Clip Plus - Instead of having compact menus, this tool runs entirely in a full screen window, albeit one that is much more organized and modern looking than Clipboard Assistant. While we could see how some users might prefer a single-window solution, Clip Plus doesn't provide the level of functionality we'd expect from a clipboard manager, lacking hotkey settings for instance and other features that are available for free in Ditto and others, whereas Clip Plus costs $12 after 30 days. 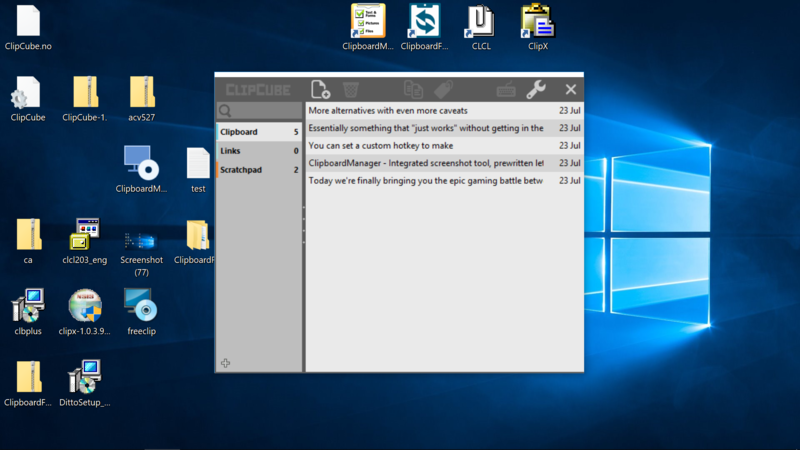 As a final mention, ClipCube may be of interest if you want a barebones tool that only records text from your clipboard, runs in a single emulator-esque window that closes to your system tray and has just one page of options. 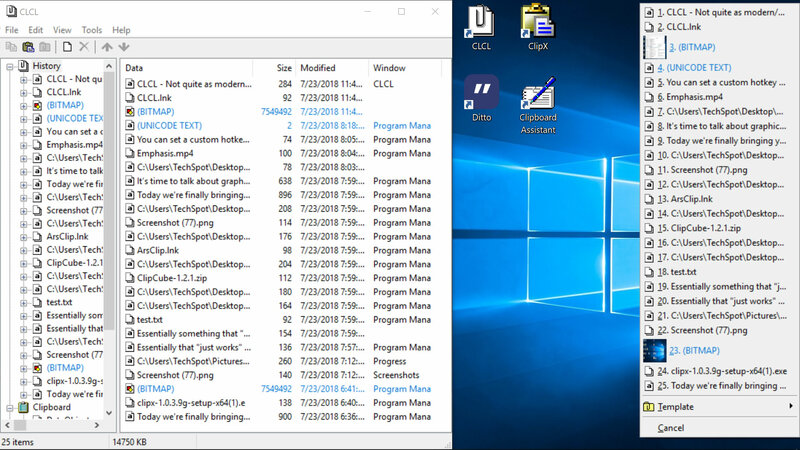 However, it's lightweight and works well as a basic clipboard manager if you aren't looking for bells and whistles but simply want a running history of the text from your Windows clipboard.